I’m back after an extended absence with some exciting news that actually helps explain that absence. 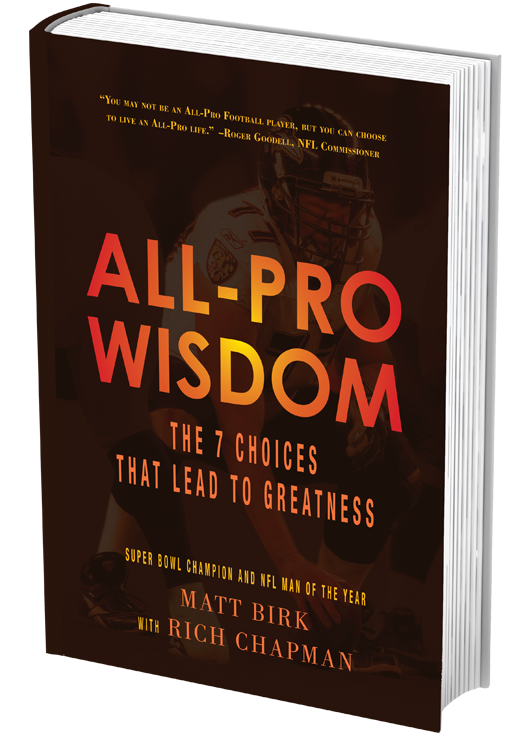 Super Bowl fever is spreading here in Colorado, but even if you don’t like the Broncos or Seahawks, you will love the new book I wrote with NFL All-Pro center Matt Birk and business/leadership guru Rich Chapman: All-Pro Wisdom: The 7 Choices That Lead to Greatness. Matt is scheduled to discuss the book on “Hannity” on Fox News this Thursday night Jan. 30. 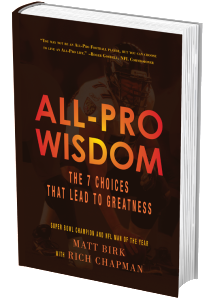 All-Pro Wisdom explores issues of character and commitment that lead to greatness in all areas of life, and features insights from other all-pro players, including the NFL’s 2012 Walter Payton Man of the Year Jason Witten, Jerod Allen, Anquan Boldin, Adrian Peterson, Troy Polamalu and Aaron Rodgers. You can learn more about the book here and purchase the book here.